An Ordinary Pen: We have a bed! ... Again! In September of 2013, Josh and I were getting ourselves set up for foster care. We really didn't need much, but one of our biggest needs was either a bed or a crib to make room for our foster babies. God provides in the bigs and littles. The timing was perfect and beyond what I had expected. I love when God uses people to meet each other's needs. You can check out our post about getting Big Brother A's toddler bed here. You know what? Big Bro A is starting to outgrow that little bed. He's 3 1/2 now. Josh and I have been talking about looking around for a bigger bed for him. We weren't ready to make a priority out of it, budget-wise. He could technically still fit in the little bed. It was just getting a little less roomy. Guess what? One of the amazing people we have had the privilege of meeting through foster care offered up a free race car bed and mattress. It couldn't have been more perfect for our little dude. 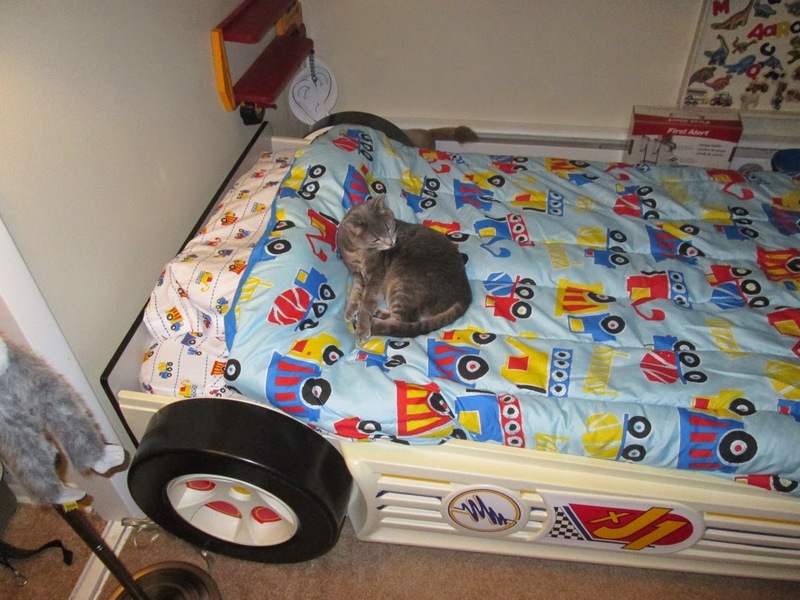 We might not use the toddler bed right away. But now we can, if we need it. You never know. I just love that our God is a God who pays attention to detail. The big questions - how long will Baby S be here; how do we love on his Parent and still keep healthy boundaries; what does our future family look like - those won't be answered any time soon, despite my wish for answers! But the little things make me remember : God knows. And he cares. Ignore the cat. She's not your friend. This is the only time she will look cute to you. The other times she will be hissing.